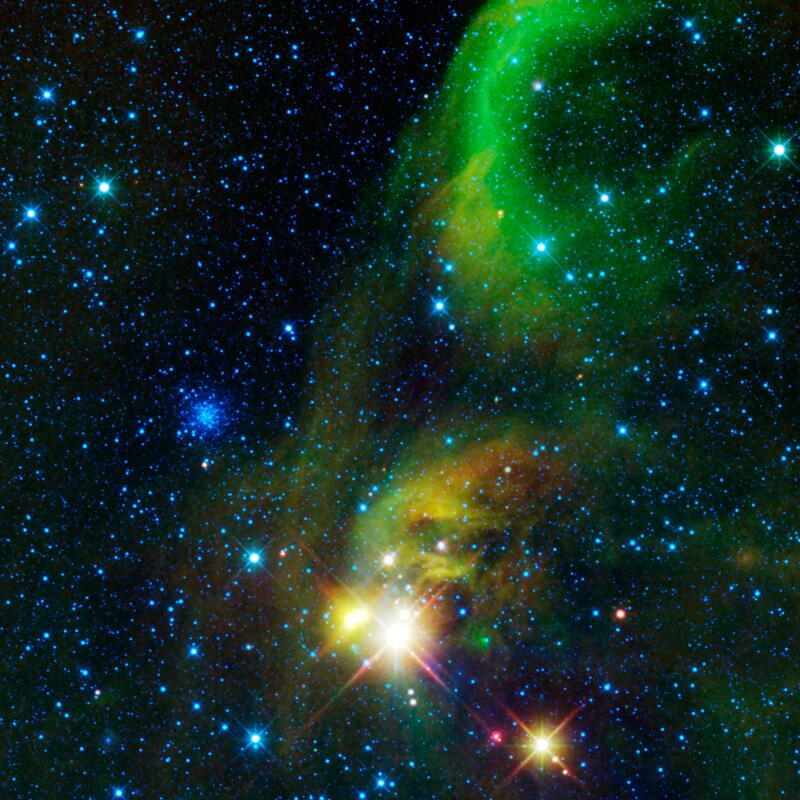 This colorful image from NASA's WISE (Wide-field Infrared Survey Explorer) is a view of an area of the sky over 12 times the size of the full Moon on the border of the constellations Sagittarius and Corona Australis. 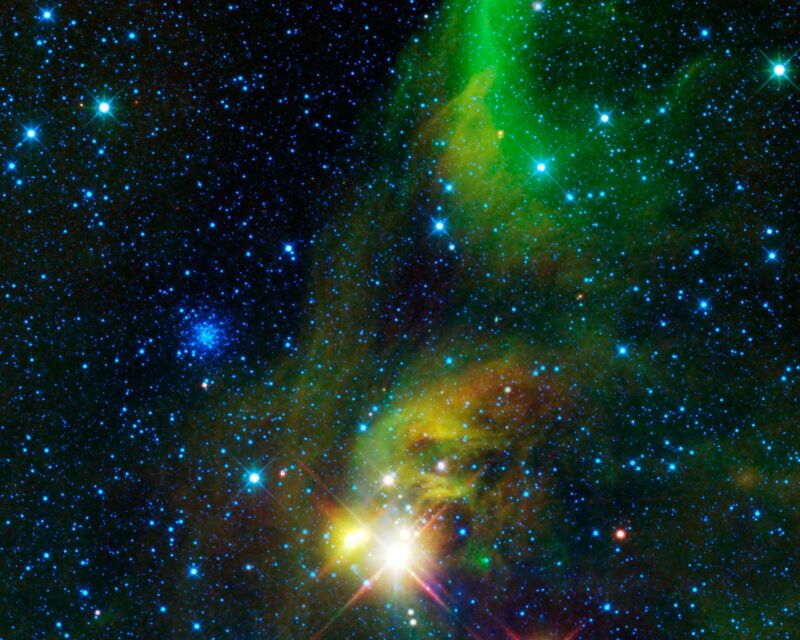 Two types of star clusters are visible in the image. The wispy nebula running top to bottom of this image is a nearby star forming region. In visible light the dust within the nebula obscures and reflects the light of the stars within and behind it, giving rise to several catalogued nebula (NGC 6726, NGC 6727, NGC 6729, IC 4812). 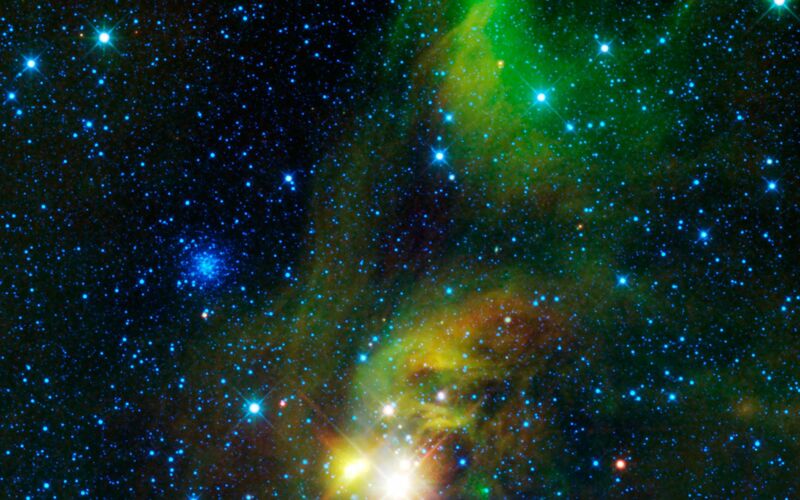 But here in infrared light we see the light of the dust itself as it is warmed by the light of the newborn stars in the cluster (green and red). We also see through the dust to peer at the stars nestled within (blue/cyan). This star cluster has been called the Coronet Cluster. 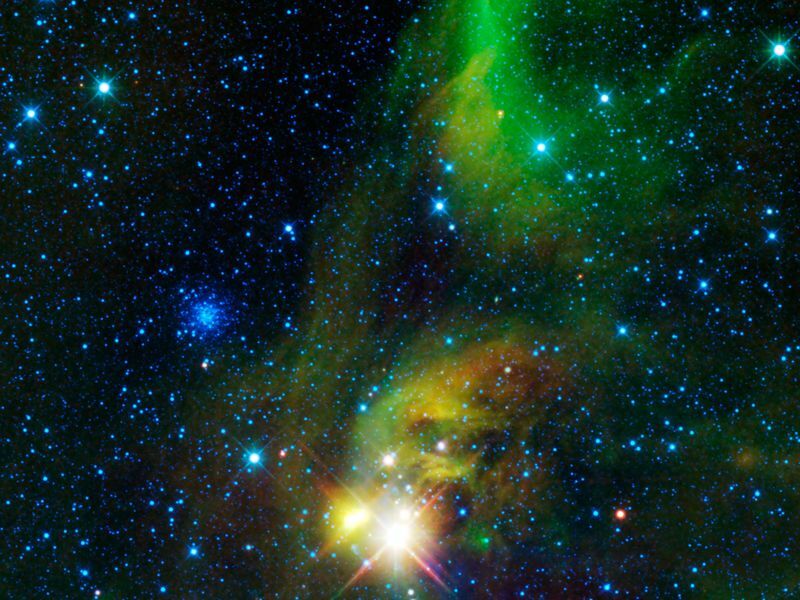 It is located some 420 light-years from Earth, and stretches about 10 light-years across. The Coronet Cluster is a relatively loose cluster of only a few dozen stars, many of which are only a few million years old. Just to the left of center is a very different kind of star cluster. NGC 6723 is a globular star cluster located some 29,000 light-years away from Earth, and spans about 65 light-years in size. Globular star clusters contain hundreds of thousands to millions of stars and orbit around the Galaxy in a spherical halo surrounding it. These are some of the oldest stars in the Universe, over 10 billion years old. NASA's Jet Propulsion Laboratory, Pasadena, Calif., manages the Wide-field Infrared Survey Explorer for NASA's Science Mission Directorate, Washington. The mission's principal investigator, Edward Wright, is at UCLA. The mission was competitively selected under NASA's Explorers Program managed by the Goddard Space Flight Center, Greenbelt, Md. The science instrument was built by the Space Dynamics Laboratory, Logan, Utah, and the spacecraft was built by Ball Aerospace & Technologies Corp., Boulder, Colo. Science operations and data processing take place at the Infrared Processing and Analysis Center at the California Institute of Technology in Pasadena. Caltech manages JPL for NASA.